Michael is now a CAT 3; just a devastating storm headed for the FL panhandle. Quietace wrote: I'll let you guys know how this goes the next 24-36 hours. Looks pretty damn healthy on Infrared right now and pressure continues to lower. I wouldn't be surprised if this makes it to Cat 4 and even if it plateaus it will still be devastating with wind and storm surge. My boy Mike is a CAT 4 minimal at this point with the latest extrapolated information from my little eye. God help those is his way all the way through the Carolinas. The storm surge is going to be historical along teh Big Bend Coast unlike Flo - teh shallow shelf there is going to exasperate this affect I hate to say he will be destructive if not devastating to the NE quadrant my lord he is angry!! 951 mb sonde splash with 19 kt sfc winds. Probably 949 mb now. ace, stay safe!! keep us posted. CATEGORY F*ING 4 & strengthening! SoulSingMG wrote: CATEGORY F*ING 4 & strengthening! Michael is going for cat 5 imo. Ray I think you were wrong on this one and I wish u weren't. Ts winds already well onshore landfall is not far away. Crazy. I can't say I hope it won't be bad cuz it will so I will say I hope everyone evacuated cuz there's really no time left. Wow several days ago a meer ts to this monster. I have rarely if ever seen such a tiny eye in such a big hurricane. 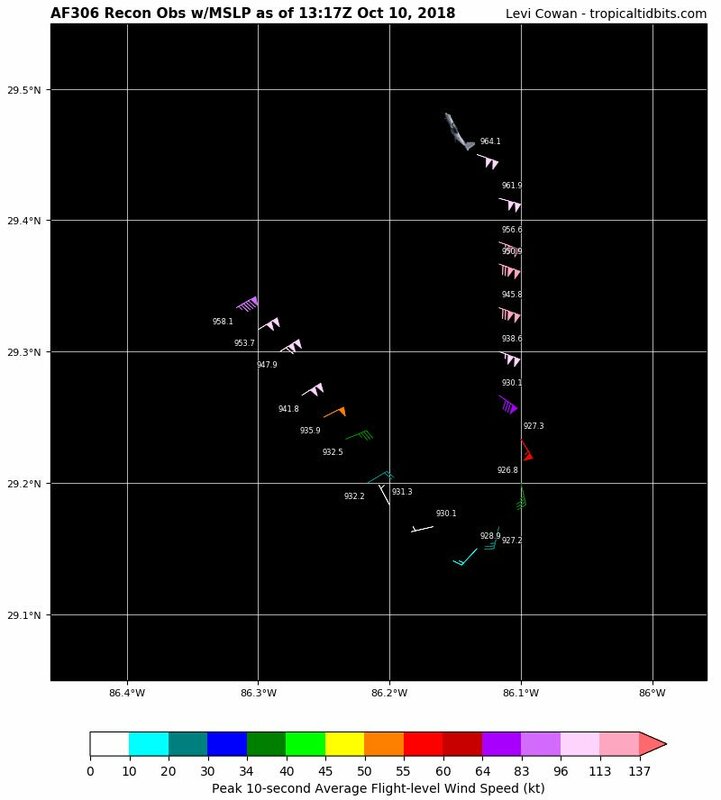 Recon is finding steadily dropping pressure down to 937mb on special update on nhc. The 2 to 4inches of rain also jogged much further north now giving parts of the area a flooding rain. If he hugs the northern part of the cone we will see a ton of rain. Not sure if winds will be a factor prolly not but still he is go pass just far enough south looks like. Some euro ensembles have him still sub 960mb coming off the coast that's impressive after being over land so long. On a side note I read Linda is now the longest living named storm in the Atlantic. I dunno if its the first but its alsoheaded home to Africa lol. Relocated to the north. Michael now down to 933mb and max winds at 145. Damn. Max sustained winds now up to 145 MPh...don't be surprised to see a Cat 5 landfall after noon. SoulSingMG wrote: Max sustained winds now up to 145 MPh...don't be surprised to see a Cat 5 landfall after noon. just nuts these storms have defied all odds. CAT 5 status Pressure wise - jesus the Storm Surge maybe 30' plus with those shallow waters once he comes onto land. that is just insanity..I just heard that the eye wall size is increasing, but what would that really do?